Are you considering Laser Hair Removal but have a thousand questions in mind? So stop worrying, we’re here to help you. As we are the leading clinic of Delhi and Gurgaon for the treatment of Laser Hair Removal, we’ve got all the answer of your questions. Take a look. Who doesn’t want to get the smooth and silky skin? Body and face hair has to be one of the most irritating things to deal with. If you are into your body hair, then it’s totally cool but if you’re a fan of smooth and silky skin, then Laser Hair Removal is the good option for you. Yes, it’s expensive than the razors and waxing, but it is a permanent solution and you’ll save yourself money in the long-run. Not only money, but you’ll save your precious time and most importantly all the pain. What is the procedure of Laser Treatment? There is a pigment that lives within the hair follicle is known as melanin. Laser hair removal mainly targets the melanin, heats up, which destroy the follicle completely and this eliminates the growth of the hair in skin. Laser Hair Removal is only for Women? Well, men and women both can take Laser Hair Removal treatment. Laser can help the guys who are frustrate of the amount of hair they have. So, men what are you waiting for? Go for the Laser Hair Removal now. Sessions are totally depends on the area being treated. You need multiple sessions to get rid of unwanted hairs. Laser may take 6-8 sessions as it doesn’t immediately get rid of all hair. After the treatment, some hair will never grow back while some hair may still need occasional treatment. You would be happy to know that laser is not painful as waxing. It is not so painful procedure, even when you take it, you will say, why didn’t you take it earlier? Don’t wax or pluck your before the laser hair removal because waxing eliminate the pigment and hair entirely and so we’d zap away at nothing. Avoid the sun exposure as much as you can because professionals won’t treat client with sunburn as it can put you at risk of ineffective and painful laser hair removal. How much Laser Hair Removal Cost? This completely depends on your geographical location and clinic to clinic. As laser hair removal treatment require 6-8 sessions, so treatments are usually sold in packages and cost varies on the treatment area. Chin, eyebrows, upper lips are usually falls under the category of small treatment area, while Inner thighs, Underarms, bikini line falls under the medium treatment area and full body, shoulders, arms, lower legs, lower back comes under the largest treatment area. 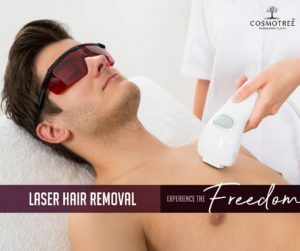 We at Cosmotree providing 40% discount on the Laser Hair Removal Treatment for the limited time. If you are looking for the laser hair removal, schedule your appointment now with us and the consultation with our experts is free of cost. Cosmotree Clinic is well known for providing best Laser Hair Removal treatment in Delhi and Gurgaon with 100% guarantee results. This entry was posted in Uncategorized and tagged Laser Hair Removal, Laser Hair Removal Cost, Laser Hair Removal in Delhi, Laser Hair Removal Price, Permanent Hair Removal. Bookmark the permalink.